Energy Wise Tips are dedicated to bringing you an energy tip to save you energy and money! In 2016, Nebraska had over 9.3 million irrigated acres. About 80% of those irrigated acres use center pivots as their water delivery system. Since being invented by Frank Zybach in 1940, an estimated 78,000 systems are in use across the state. Of those, about 53% are supplied water by an electric-driven pump. While not always the case, the majority of pivots operate on a quarter-section of land (160 acres) that is square (1/2 mile wide x 1/2 mile long). By locating the starting point of a standard ¼-mile long pivot in the center of the field, a full circular rotation of the system irrigates approximately 125 to 141 acres depending whether an end gun is used. This leaves 19 to 35 acres in the corners not watered. By 1970, pivot manufacturers were producing corner pivot systems that have a special arm to swing out when approaching corners and then tuck back in when approaching the center of field edges. 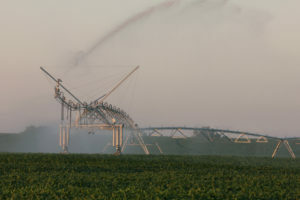 Compared to the standard pivot operating on a quarter-section of land, an additional 14 to 31 acres can be irrigated. Most existing systems have a buried, low-voltage wire around the outside of the field and a radio receiver on the corner arm to follow and direct the steering system. Recently, some newer guidance systems take advantage of a global positioning system (GPS) to direct the corner arm, thus eliminating the need for a buried guide wire. When the corner arm is fully operational, water flow requirements increase about 40% as the system delivers greater volume over a greater distance. Pumping systems, including the size of the electric motor, are designed to account for this increase in flow. However, this maximum flow is only needed about 20% of the operating time. To adjust, pressure and flow regulators reduce output to match water delivery. Unfortunately, the pump motor continues to operate at 100% output and wastes energy 80% of the time. If the pump motor is compatible, this energy waste can be reduced by installing a variable frequency drive (VFD). VFDs vary the frequency and voltage of electricity supplied to the pump motor based on the changing flow requirements, thus eliminating most of the “overpumping”. In a report published through the University of Nebraska last year, CONSERVATION OF ENERGY USING VARIABLE FREQUENCY DRIVE FOR CENTER PIVOT IRRIGATION SYSTEMS IN NEBRASKA (Dilshad Brar, M.S.University of Nebraska, 2015), data reveals that energy efficiency savings of 20 to 30 percent are achieved for center pivot corner systems when paired with VFDs. To find out more about whether a VFD can bring energy savings to your irrigation, contact Perennial at 402-362-3355. You may even find you are eligible for EnergyWiseSM incentives for helping with the cost of other energy-saving home improvements.